I haven’t seen a movie this hyped since Gravity, and if you’ve read my review of that film you’ll know that I am one of the few who left the theatre very unimpressed. Not by the special effects, those were as advertised, but by the lack of a strong story & quality acting. Those are really the only things I need, a plot that grabs by interest & at least one actor who makes me believe. Gone Girl made me a little nervous, based solely on the chatter, on the assumption that everyone and their brother would love this film, that it was just too good to miss. Thankfully it didn’t go down the Gravity route, all glitter & no substance. Gone Girl delivered in the story & acting categories, giving us a movie to talk about the next day, but falling just short of the greatness. Nick & Amy, the it couple. They’re young, attractive, still childless five years into their marriage, live in a small Missouri town in a nice house in a nice neighborhood; what more could you ask for? And yet, on the morning of their anniversary, Nick seems unsure. Talking with his sister in the bar they both own, he brings up his doubts about he & Amy’s ritual scavenger hunts, the truth that he’s starting to forget the answers to her romantic clues. But home he goes to face the yearly disappointment, only to find Amy gone. Not only that, but a table is smashed, an iron is left on, and an envelope is waiting to start him in a game that may not have a winner. When the police are called and the town begin to search for the missing girl, Nick is dragged into a media circus, a blame game, and a mystery whose solution will turn out to be exactly as complicated as this perfect couple’s marriage. Let’s start with the good, and that’s Ben Affleck. He’s done his fair share of crap and sometimes he comes off as a meat-head, but it can’t be denied that the guy can act. He’s a naturally gifted actor who brings himself into every role, making each character believable in a unique way that not many people can pull off. He’s not Daniel Day-Lewis, who transforms himself for every role; he’s Ben Affleck, the dude, the guy, you know what you’re going to get in his films, and that’s not a bad thing. As Nick, Ben is spot on, playing confused and careless with a frat boy air, but with an undertone of something more sinister that keeps his character interesting. And we can’t forget David Fincher, an incredible director whose films always impress with their dark edge. Se7en, The Game, Fight Club, Zodiac; all quality movies that can stand alone as solid ideas well executed. 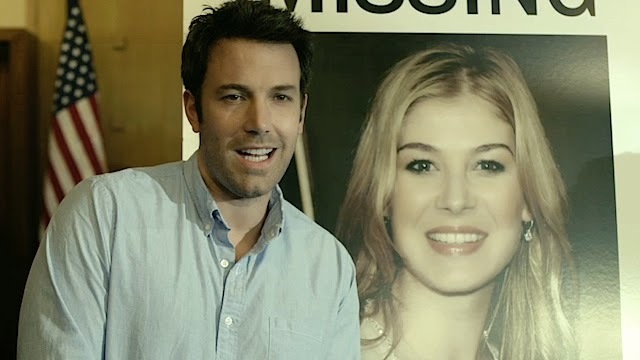 But there are some problems that keep Gone Girl from excellence. First is its length. I’m a person who can sit still for an above average time, but even I found myself getting a little antsy during 150 minutes of the film. And not only was it a tad too long, but it was basically broken down into three acts, segments that felt disconnected from each other, a trio of stories that needed to be brought together in a more concise manner. The plot itself was very intriguing, but it felt like Fincher was doing all he could with a popular yet not wonderful story. The book was written two years ago by Gillian Flynn, and I wonder if it’s not very good. It seems over-complicated, over-worked, and hosting too many characters. These characters in the film were done well, but they almost became cameos that distracted from the essences of the movie. An ex-lover, a famous lawyer, a do-gooder detective, an edgy sister, a stereotypical neighbor, a hot student, a trashy acquaintance, a couple TV personalities; too many sidelines, too much mess, additives to the story that I didn’t want. I wish Fincher had made everyone angry by just chopping the book to pieces. Take the bare bones, the excitement, make it more visceral, darker, more focused on one or two characters, cut the crap, and give us a film that dares to be different, not a movie version of a bestselling page-turner. 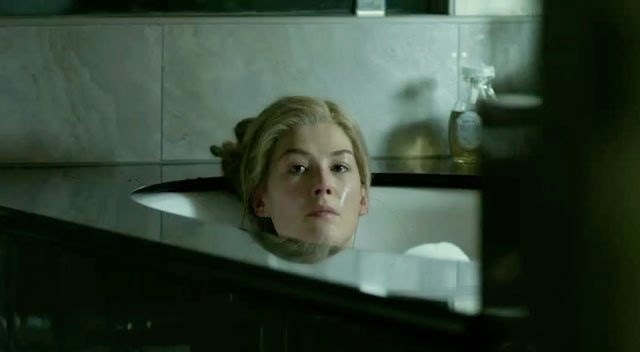 That’s what Gone Girl ended up being; a good, sometimes shocking, narrative that probably does justice to the book. But I wanted less, I guess, a simpler version that ignored the potential profits and focused on the roots, a film worthy of being called one of the year’s best.